The more I review TB's cap situation, the more I wonder if the temptation to bridge Kucherov will be too strong for Yzerman to resist. At first blush, the thought of a bridge deal seems patently unfair to a player who has scored 131 points in 159 games over the last two seasons. It seems almost like a penalty against a player who is arguably the team's offensive leader. Why should Kucherov have to sign a short-term deal worth somewhere in the neighborhood of $4M per season given all he's done for the team? Don't be a monster, Steve!! But, is a bridge deal really all that harsh from a dollars and cents perspective? If you're looking at year one, then sure. $6.5M (or thereabouts) in the short-term is obviously better than $4M (or thereabouts) in the short-term. Over the long-term, though, the difference between a bridge deal and a long-term deal being signed now really isn't all that significant. Consider the following: If Kucherov signs a bridge deal now and continues to produce, his value on his next contract will be even higher. 1) What do you think long-term deal signed today would look like for Kucherov? 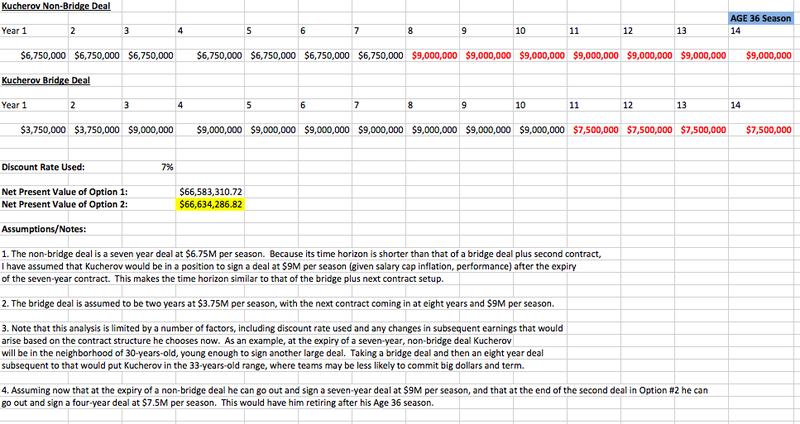 2) What do you think a bridge deal and subsequent contract would look like for Kucherov? People obviously had different ideas as to what makes sense in each of those scenarios, but the general consensus seemed to be that a long-term deal today should be in the neighborhood of $6M to $7M per season over six to eight years; a bridge deal, on the other hand, was estimated to be around two years in length with a cap hit between $3M and $5M, with the next contract coming in at eight years and $8M to $9M per season. This is what I worked with for the purposes of this analysis. Using a historical stock market return rate of 7% to discount future earnings, we can estimate the real value of each of the contract options presented to determine if a bridge deal is really all that unfair from a dollars and cents perspective. DISCLAIMER: This analysis is loaded with assumptions. In order to present a full picture, I had to make assumptions regarding Kucherov's potential future earnings and retirement dates. My analysis has him retiring in his age 36 season, after what will hopefully be an illustrious career with the Lightning. The assumptions made with regards to numbers and term are listed within the image. 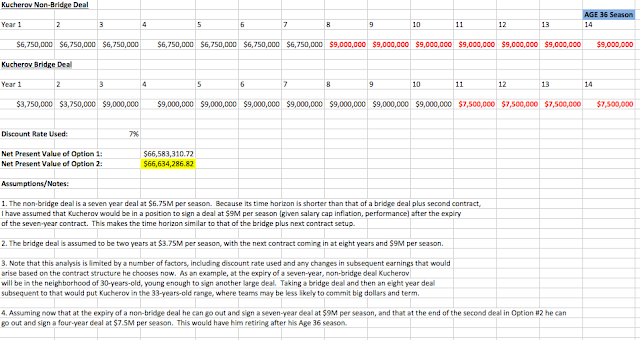 In short, Option 1 has Kucherov signing a seven-year deal worth $6.75M per season now and then signing a seven-year deal worth $9M per season at age 29/30 based on his continued elite production; Option 2 has Kucherov signing a two-year bridge deal worth $3.75M per season now, an eight-year deal worth $72M total after that, and then a four-year deal paying him $7.5M to end his career. Again, the real value of the two options is almost identical; this time it's the non-bridge deal taking away the Gold medal by a slim margin. What's the point of all this? The point is that, assuming he continues to produce at an elite clip, the difference between taking a bridge deal and cashing in later versus cashing in now is virtually non-existent. Kucherov will find himself in a very similar position, regardless of which option he chooses. Taking a big discount now on a short-term bridge deal might sound like a big sacrifice, but the increased payday on his next contract can and likely would make up the difference. Of course, the big x-factor here is the value to be placed on security. 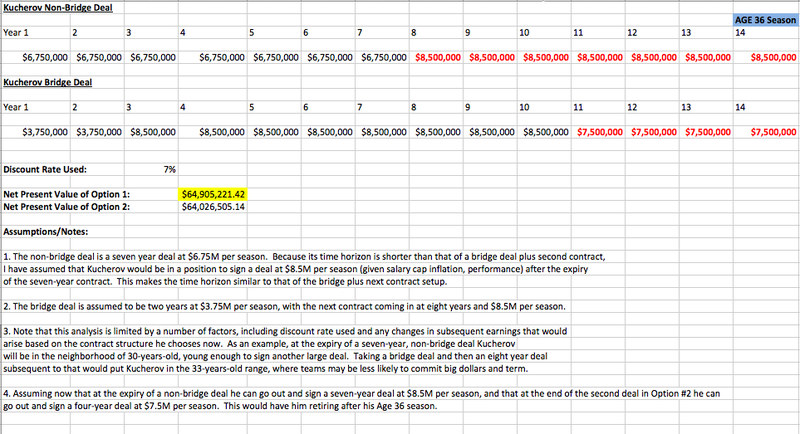 What happens if Kucherov signs a bridge deal and gets injured? What happens if his production falls off a cliff? His ability to cash in big time on the next deal would be severely compromised. For the bridge deal option to be attractive, it's likely that there would have to be some sort of risk premium associated with it. But, if that means increasing the value of the bridge deal itself, doesn't that sort of defeat the whole purpose of signing him to a bridge deal in the first place? So, let me make one thing ABUNDANTLY clear: This blog was not written with the intention of convincing you that a bridge deal makes more sense for Kucherov, or that Kucherov should bow to whatever Yzerman has put in front of him. Rather, its purpose was to clear up the misconception that a bridge deal is somehow unfair to Kucherov from a dollars and cents point of view. There are still plenty of reasons for Kucherov to want a long-term deal now as opposed to a bridge deal, but with little leverage he may find himself in a situation where he doesn't get what he wants right away.